On the green in 1957 for the St. Paul Open Golf Tournament. In 1931, a couple of years after the course opened, undercover FBI agents were suddenly attracted to Keller Golf Course (GC), not for the fabulous golfing, but for its notorious golf patrons. Legend has it that the infamous bank robber, John Dillinger, would frequent the course with two golf bags – one with clubs and the other filled with machine guns. Young caddies would earn generous tips for toting the extra firepower. There are even tales of cagey gangsters being chased off the course by federal marshals, leaving their clubs, and jumping on a nearby train for a getaway. Well, even if these gangster stories seem a bit farfetched, everyone can agree that Keller GC enjoys an incredibly robust golf history. It has played host to a PGA tour stop, the St. Paul Open for 38 years, two National PGA Championships, and the Ladies PGA Tour nine times. On top of the tournaments, the course has been a local favorite for tens of thousands of recreational golfers for nearly a century. In 1996, Superintendent Paul Diegnau, had a vision to minimize the golf course’s impact on the environment, striking a balance with the landscape and restoring and preserving its unique natural features. Over the years, Diegnau has been committed to preserving the top-flight golf experience, and at the same time, establishing an “urban nature preserve” on the property. “I have been able to implement a variety of management practices that have multiple benefits – to the course and to the natural environment,” he says. Ten years ago, the Watershed’s Landscape Ecology Awards Program (LEAP for short) recognized Paul’s work and presented him with top honors in the commercial-government land category. Through the awards process, Diegnau had a chance to get to know Bill Bartodziej, a Natural Resources Specialist with the Watershed. “Paul is one of our local leaders that have stepped up to try some innovative practices. The LEAP Award opened the door for the Watershed and Keller GC to really start discussing partnership possibilities,” Bartodziej said. helps seed prairie areas in the Keller restoration. This spring, the Watershed and Ramsey County received funding from the Ramsey Conservation District to restore seven acres of no-play area. A Phase II project, slated for next year, will likely treat another seven acres. Project sites included pond and wetlands buffer areas, prairie, and woodlands. “This will likely be the number one golf course in the Metro area that supports such large expanses of high quality natural areas.” Bartodziej said. 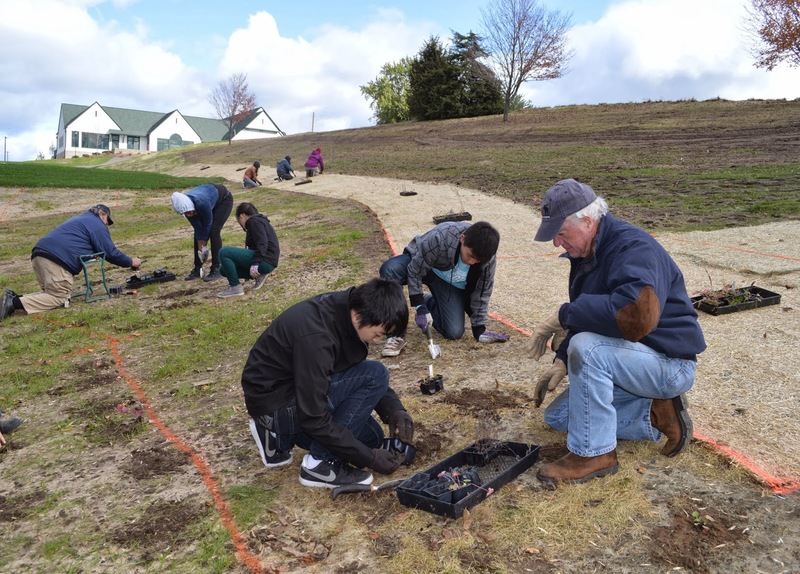 Jerry Horgan (foreground) and Don Vegoe (background), both Ramsey County Master Gardeners, help students put in native plants in a new restoration area below the 12th tee complex. The newly-renovated club house can be seen in the far background. Diegnau was pleased that this restoration project coincided with major golf course and clubhouse renovations. The course shut down in the fall of 2012 and is scheduled to reopen in the summer of 2014. Having the course closed made it easier to bring in materials, work trucks, and work crews for the ecological restoration. As with most large restoration projects, the Watershed partnered with Ramsey County Corrections work crews. In addition, students from Farnsworth Aerospace 5-8 School and the French Immersion School had a chance to plant plugs in one of the prairie restoration areas. Updates on the course renovation can be found at: http://kellerrenovation.blogspot.com. Keller GC is an excellent example of effectively mixing land uses with the goal of improving natural resources. Very soon, golfers will hit long drives on the newly seeded, lush and green bentgrass fairways, and then grab a cold drink in the newly renovated clubhouse. But wait, there is a rare bonus. The urban golf experience will be maximized at Keller by providing a tranquil, intriguing, and very dynamic setting. The natural habitat areas hold soils in place, filter runoff, and attract an amazing diversity of wildlife. Next summer, golfers will view acres of prairie flowers in bloom and wildlife in action – great blue heron searching for elusive frogs, a curious juvenile fox pawing at a golf ball, and mamma wood ducks herding their young through the lush stands of native shoreline vegetation. Get ready for an unbelievable outdoor experience! The restoration at Keller Golf Course’s water feature on the 6th hole looks amazing with the late fall colors. To see the student planting activities associated with Keller Golf Course this week, see our article Mending the Pot.